For over 100 years, the Patapsco River has been impacted by the presence of several dams that were designed and built at the beginning of the 20th century. The objective of the project is to monitor suspended-sediment transport resulting from the removal of Simkins Dam on the lower Patapsco River in November 2010. The role of USGS in the project includes operation and maintenance of 3 stream gages along the main stem of the lower Patapsco River for continuous discharge and turbidity, and periodic suspended-sediment sampling during base flow and selected storms. Background: River-channel morphology adjusts to achieve an equilibrium defined by sediment transport, streamflow, and slope. Disruption of any of these factors will lead to a change in channel morphology with consequences to aquatic habitat within and near the channel. Station 01589000, Patapsco River at Hollofield--looking downstream at low-water control section. Station 01589025, Patapsco River near Catonsville, MD, looking downstream at low-water control section. Dam construction changes both the flow distribution and sediment-transport characteristics of downstream reaches, typically resulting in channel incision, constriction, or widening, and bed material coarsening (Williams and Wolman, 1984; Montgomery and Buffington, 1998). For over 100 years, the Patapsco River has been impacted by the presence of several dams that were designed and built at the beginning of the 20th century. In June 2010, one of these dams was removed (Union Dam), but it was anticipated that that this would have little impact on stream morphology or sediment transport, because this dam was breached in 1972 and impounds no significant amounts of sediment (Stillwater, 2010). Further downstream, however, Simkins Dam impounded roughly 90,000-100,000 cubic yards of sediment prior to removal of the dam in November 2010 (Inter-Fluve, 2009). Most of this material was sand, with median particle diameters ranging from 0.5 to 2.0 millimeters. Mobilization of this amount of sand in the months and years following the removal of Simkins Dam is anticipated to cause changes to channel morphology, and aquatic and riparian zone habitat. Suspended sediment data and loads are a necessary component in quantifying these changes. Station 01589035, Patapsco River near Elkridge, MD, looking downstream at low-water control section. Objectives: The objective of the project is to monitor suspended-sediment transport resulting from the removal of Simkins Dam on the lower Patapsco River in November 2010. The data collected and analyzed to accomplish the objective will be available for use in additional analyses of impacts on the channel geomorphology, and the aquatic and riparian-zone habitat of the river reaches affected by the dam removal, and to support planning for the removal of Bloede Dam, which is located 2,400 ft downstream from the former location of Simkins Dam. Approach: The role of USGS in the project includes operation and maintenance of 3 stream gages along the main stem of the lower Patapsco River for continuous discharge and turbidity, and periodic suspended-sediment sampling during base flow and selected storms. Continuous streamflow and turbidity data are being collected and analyzed for the 3 main stem Patapsco River stations, and published on a yearly basis since October 2010. Suspended sediment discharge (tons/day) is being computed and published yearly for each of the 3 main stem Patapsco River stations. Inter-Fluve, 2009, Simkins Dam Removal Draft Sediment Management and Water Routing Plan, July 15, 2009: Technical Report, prepared by Inter-Fluve, Madison, Wisconsin, for American Rivers, Washington, D.C., 177 p.
Montgomery, D.R. and J.M. Buffington, 1998, Channel processes, classification, and response, in River Ecology and Management, edited by R. Naiman and R. Bilby, Springer-Verlag, New York, NY, p. 13-42. Stillwater Sciences, 2010, Simulating Sediment Transport in the Patapsco River following Dam Removal with Dam Removal Express Assessment Model-1 (DREAM-1): Technical Report, prepared by Stillwater Sciences, Berkeley, California for Inter-Fluve, Madison, Wisconsin, and American Rivers, Washington, D.C., 32 p.
Williams, G.P., and M.G. Wolman, 1984, Downstream effects of dams on alluvial rivers: U.S. Geological Survey Professional Paper 1286. 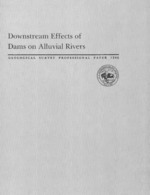 Downstream effects of dams on alluvial rivers; 1984; PP; 1286; Williams, G. P.; Wolman, M. G.